Screenplay: Peter Weir, Keith R. Clarke. 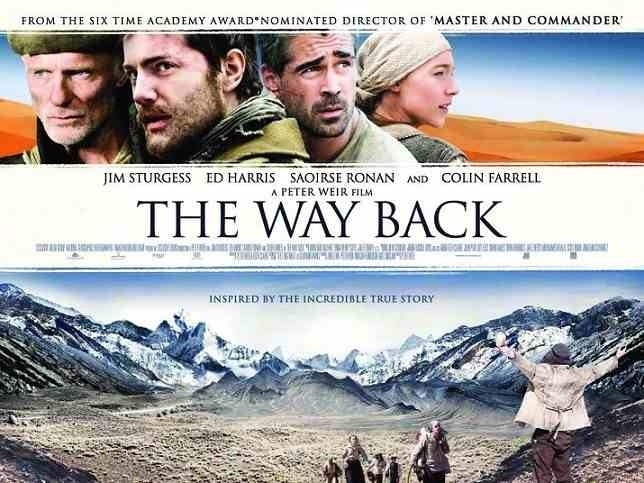 Starring: Ed Harris, Colin Farrell, Jim Sturgess, Saoirse Ronin, Mark Strong, Gustav Skarsgard. An epic human endeavour film was a great chance for director Peter Weir to gain back some respect after the disappointing dud “Master and Commander”. It’s a chance that Weir has passed up though, as this is just as much of a letdown as his last outing behind the camera. In 1940, seven prisoners escape from the confines of a Russian gulag in Siberia, and set out on a gruelling, 4,500-mile trek across some of the world’s harshest terrain, with little food and few supplies. Their efforts are almost certainly doomed, yet they would rather die as free men than Stalin’s prisoners. With “Master and Commander” Peter Weir last helmed the camera in the water. With this, he is very much on dry land but unfortunately his results are much the same. This is a real bore-fest. What we get are lots of weather beaten skin and ground beaten feet. The occasional bout of starvation is thrown in and that’s pretty much the jist of the whole film. But ultimately, we the audience, are starved of anything that resembles substance. Fortunately we get a few crumbs tossed our way with some gorgeous scenery by cinematographer Russell Boyd. There’s no doubt that this looks fantastic but it’s not enough. Not nearly enough. The film is as long and arduos as the supposed journey. The characters are interesting, most notably Colin Farrell’s thief Valka, but he leaves the film far too soon and the likes of Ed Harris and especially Saoirse Ronan have very little to do. There’s no faulting the performances, the actors do what they can with the limited material which is flimsy and seriously underwritten. In fact, it was exposed as being based on a complete lie and not the true adventure it had been labeled as. Not a good start…not a good middle and not a good end either. The only thing it had in it’s favour was the wonderful scenery, but then again, with a film that is backed by National Geographic, you expect that certain standard. A real disapointment from director Peter Weir. I have come to expect more from him. It will appeal as a travelogue maybe, but as a form of entertainment, it has about as much appeal as looking at someone else’s holiday snaps. This entry was posted on January 29, 2012 at 6:41 pm and is filed under Adventure, Drama with tags 2010. You can follow any responses to this entry through the RSS 2.0 feed. You can leave a response, or trackback from your own site.